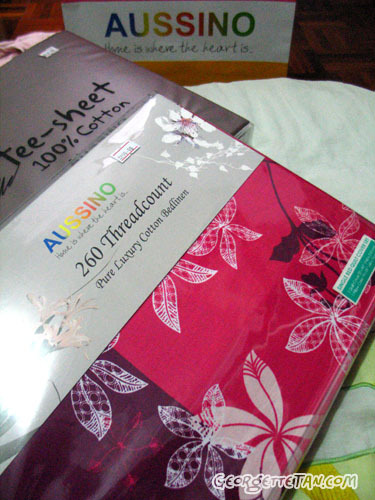 You know it’s meant to be when you decide to walk into Aussino to see what kind of sheets they have in stock, immediately see something you want, and then find that they have a generous discount for members AND it’s the last day of their extremely quiet sale. I only buy bed linen once every few years, usually when the current two in rotation starts showing wear and tear. In my case, I only have one quilt cover and only recently thought of getting a second one when one corner of mine disintegrated in the last laundry run. The above image was taken from the packaging. I originally wanted the green one cause it was the first one I saw, but they didn’t have any more for singles. They did, however, had it in pink. I also got a set of fitted sheets in brown, from the T-sheet series. I spent a bomb on this but without the convenient discount, I probably won’t have gotten anything at all.